Hetman is a political title from Eastern Europe, historically assigned to military commanders. 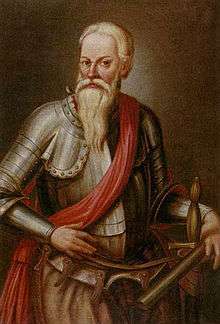 It was the title of the second-highest military commander (after the monarch) in 15th- to 18th-century Poland and the Grand Duchy of Lithuania, which together, from 1569 to 1795, comprised the Polish–Lithuanian Commonwealth, or Rzeczpospolita. For much of the history of the Principality of Moldavia, the Hetman (Rmn. hatman) was the second in rank in the army after the ruling prince (who held the position of Voivode). Hetman was also the highest military office in Ukraine's Hetmanates, the Zaporizhian Host (1649–1764) and Ukrainian State (1918). The title (гетьман) was used by Ukraine's Cossacks from the 16th century, and by the Czechs (hejtman) in Bohemia from the Hussite Wars (15th century) on. Hejtman is today the term for the elected governor of a Czech region (kraj). One theory derives the word from the Early Modern High German Heubtmann (modern German Hauptmann), with Heubt meaning "head" and Mann—"man". Hauptmann was a common military title during medieval times, literally meaning "captain" but functionally corresponding rather to today's "general". Moreover, it has been suggested that the Czech language may have served as an intermediary. The first Polish title of Grand Crown Hetman dates from 1505. The title of Hetman was given to the leader of the Polish Army and until 1581 the Hetman position existed only during specific campaigns and wars. After that, it became a permanent title, as were all the titles in the Kingdom of Poland and the Polish–Lithuanian Commonwealth. At any given time the Commonwealth had four Hetmans – a Great and Field (deputy) Hetman for each of both Poland and Lithuania. From 1585 the title couldn't be taken away without a proven charge of treachery, thus most Hetmans served for life, as illustrated by the case of Jan Karol Chodkiewicz literally commanding the army from his deathbed (1621). Hetmans were not paid for their job by the Royal Treasury. Hetmans were the main commanders of the military forces, second only to the monarch in the army's chain of command. The fact that they could not be removed by the monarch made them very independent, and thus often able to pursue independent policies. This system worked well when a Hetman had great ability and the monarch was weak, but sometimes produced disastrous results in the opposite case. The contrast with states bordering the Commonwealth, where sovereigns could dismiss their army-commanders at any time, was immense. 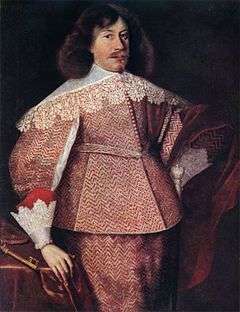 In 1648 the Zaporizhian Host (the Polish-Lithuanian Commonwealth subject) elected a Hetman of their own (Bohdan Khmelnytsky) igniting the Ukrainian struggle for independence. 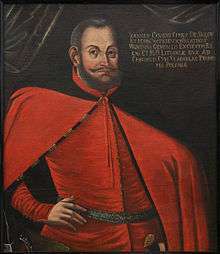 At the end of the sixteenth century, the commanders of the Zaporizhian Cossacks were called Koshovyi Otaman or Hetmans (for example: Christof Kosynsky — first Zaporizhian hetman). 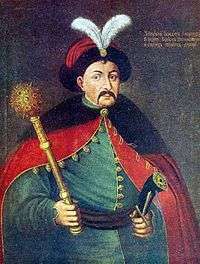 In 1572, the hetman was a commander of the Registered Cossack Army (Ukrainian: Реєстрове козацьке військо) of the Rzeczpospolita too. From 1648, the start of Bohdan Khmelnytsky's uprising, a hetman was the head of the whole Ukrainian State — Hetmanshchyna. Although they were elected, Ukrainian Hetmans had very broad powers and acted as heads of the Cossack state, their supreme military commanders, and top legislators (by issuing administrative decrees). 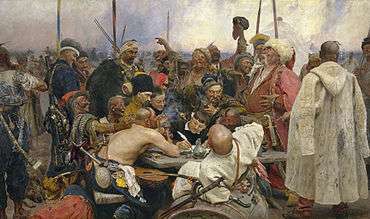 After the split of Ukraine along the Dnieper River by the 1667 Polish-Russian Treaty of Andrusovo, Ukrainian Cossacks (and Cossack Hetmans) became known as Left-bank Cossacks (of the Cossack Hetmanate) and Right-bank Cossacks. The title was revived in Ukraine during the revolution of 1917 to 1920. In early 1918, a conservative German-supported coup overthrew the radical socialist Ukrainian Central Rada and its Ukrainian People's Republic, establishing a "Hetmanate" or monarchy headed by Pavlo Skoropadskyi, who claimed the title "Hetman of Ukraine". This regime lasted until late 1918, when it was overthrown by a new "Directory" of the re-established Ukrainian People's Republic. "Hetman". Encyclopædia Britannica. 13 (11th ed.). 1911.